You don’t have to be a fashion model to dress in model fashion. Our trendy knew “Biacna” sweatshirt in white cotton/ poly knit has a fleecy underside and smooth face with “Cover” motif. Long sleeves end at wrist level in ribbed knit cuffs. The crew opening at the neck also has rib knit trim, as does the hip length bottom hem. 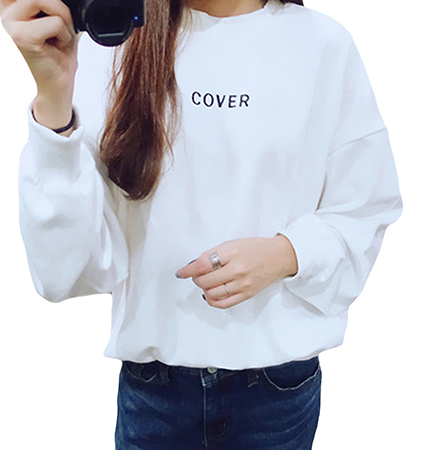 This fun white sweatshirt looks amazing with shorts, faded blue jeans, or printed leggings. You will love the many ways you can wear this top and the places you can go. Your friends will all admire your fashion sense.